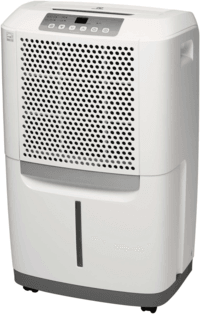 The Electrolux EXD25DN3W 25 litre dehumidifier is the larger of the two dehumidifiers that Electrolux produce. We reviewed the smaller 15 litre EXD15DN3W model a few months ago and liked it. 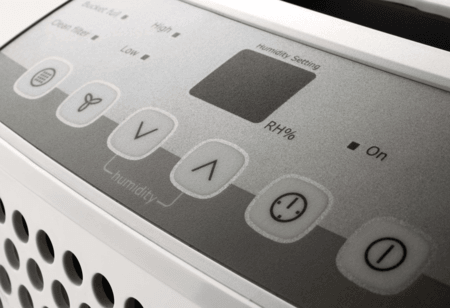 On paper this 25 litre model is one of the most powerful domestic dehumidifiers on the market, but does it really match up to our favourite model for the larger family home – the EcoAir DC202? Read our Electrolux EXD25DN3W 25 litre review to find out. The control panel is about as simple to use as it could be, thanks to the useful LCD screen that displays the humidity that you’re selecting and the timer length, should you wish to set that. Moving from left to right across the control panel, there’s the light that illuminates when the water collection bucket is full and beneath that there’s a light to remind you when the dust filer needs cleaning. There’s no intelligent mechanism that senses when the dust filter is clogged, the ‘clean filter’ light simply comes on after 250 hours of operation. The button beneath the light simply resets this timer and turns off the light. In the marketing material for the EXD25DN3W, Electrolux make a big deal of the dust filter, however you should remember that almost every dehumidifier comes with a removable dust filter. I think the reason they stress this point is to disguise the fact that the EXD25DN3W doesn’t come with either an antibacterial filter or ioniser. That said, I’m not convinced of the real need for either of those features in a domestic setting and the Electrolux is cheaper than the rivals with those extra features. The next button on the control panel sets the fan speed, which can be set either ‘low’ or ‘high’. I like that the fan speed is independent from the other settings. This is because the fan speed is the main source of noise and affects how quickly a dehumidifier can reduce the humidity, so it gives you an extra degree of control. If the noise of the machine is bothering you, just turn the fan down. Or if you need the machine to clear morning condensation quickly, just turn the fan speed up. The next two buttons control the LCD display. 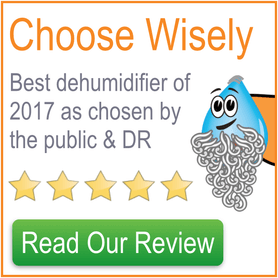 Primarily they are used for setting your desired humidity level, which can be set between 35% and 85% relative humidity in 5%RH increments. You can set the machine to continuous mode, which shows ‘CO’ on the display by trying to reduce the humidity below 35%. Setting the desired humidity level in this way is much more accurate than simply choosing a ‘low’, ‘medium’ or ‘high’ humidity and is thankfully becoming more common in the market. None of the Electrolux dehumidifiers come with a specific ‘laundry’ mode for quickly drying clothes, but you can achieve exactly the same setting by selecting continuous mode on the LCD display in combination with the higher of the two fan speeds. These settings on a dehumidifier this powerful should dry a whole load of clothes, towels and bedding in just a couple of hours. The LCD display is also used for setting the timer function. To trigger the timer mode, press the timer button, which allows you to use the LCD display and up and down keys to set the timer, rather than humidity. The timer can be set from between 30 minutes to 24 hours. Between 30 minutes and 10 hours the timer increases in 30 minute increments. Between 10 and 24 hours the timer increases in 1 hour increments. As well as timing how long until the unit stops, you can also delay the time until is starts. The delayed start function will simply run the last selected settings for the humidity and fan speed when the timer has completed its countdown. Thankfully there’s a light above the timer button that shows you when the timer has been set. I find that these timer settings are best used for tasks like drying laundry when you won’t be around to turn it off. The final button is simply the on/ off switch. If you use the dehumidifier for controlling the humidity of your whole home, rather than just drying laundry, to run it efficiently you should leave the machine on at all times. This allows the in-built humidistat to turn the dehumidifier on and off according to the desired humidity that you select. The moisture extracted by the EXD25DN3W is collected within a large 5 litre bucket. This is about as large as the buckets on domestic dehumidifiers get and you’ll be glad for it considering how powerful this machine is. There’s a thin viewing window with a red float indicator located on the front of the bucket and so it’s easy to see where the water level is at any one time. It’s simple to unclip the bucket from the rest of the unit and there’s a handle on the top of the bucket for ease of carrying. Should the bucket get filled you’ll notice that the machine shuts itself down to prevent overflows and the ‘bucket full’ light will illuminate on the control panel. Of course you could skip using the bucket altogether by using the auto-drain value, which is located on the back on the unit. The Electrolux EXD25DN3W is a very heavy dehumidifier, weighing in at 15kg, which is about as heavy as they come. Due to this you’ll be wanting to lift it as little as possible, but there is a handle that pops out of the top and also groves for your hands on either side of the machine depending on how you want to lift it. Thankfully it’s also mounted on castor wheels and rolling it is a much more sensible option. The machine is fairly large, but no larger that you’d expect of a dehumidifier possessing this power, measuring 50cm tall by 37cm wide by 29cm deep. The EXD25DN3W scores highly on the design front. The off-white and grey colour scheme, combined with the circular holes of the air intake look modern, stylish and not too bulky, which was a nice surprise considering how powerful it is. From a practicality perspective it also performs well, with a front-mounted, easy to access water collection bucket and simple to read water level indicator. The control panel is easy to use and the various handles and castor wheels make moving it around comfortable, despite its 15kg weight. The machine promotes good air circulation by releasing the dry air upwards and drawing it in on the front of the unit. This is one of the areas that lets the Electrolux EXD25DN3W down somewhat. 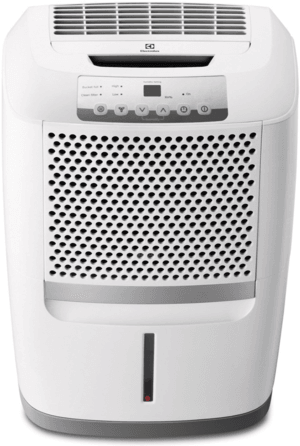 It is definitely more noisy than similarly-powered units from the top dehumidifier manufacturers like EcoAir and Meaco. Comparing just the official figures alone, Electrolux claim that the EXD25DN3W produces between 49 and 51 decibels, whereas the EcoAir DC202 produces 45dB and the Meaco 20L Low Energy produces 46dB. As this is a logarithmic scale, these seemingly small differences actually make a big difference in the real world. Of course how important the noise levels are to you depends on where you’re going to place the machine and how sensitive you are to white noise sources. This is an area where a lot of customers have been disappointed with the supposed ’25 litre’ EXD25DN3W. 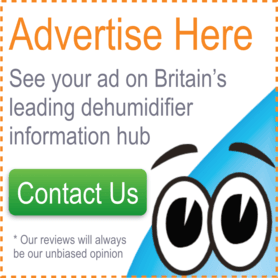 The ’25 litre per day’ claim will almost certainly have been measured under tropical conditions, which is the same as all dehumidifiers. We’d normally note the exact conditions that this was measured under, however Electrolux doesn’t seem to publish this, which puts the company on a somewhat dodgy legal footing. Under the conditions found in UK homes you’re more likely to extract between 1-5 litres per day, and much more towards the lower end of this scale once the machine has ‘bedded in’ to your home. Based on this extraction rate we’d rate this dehumidifier as suitable for up to a 5-bedroom house. Price is certainly one of the positive aspects of this machine, as it costs considerably less than rivals with a similar extraction capacity. However, this machine draws up to 745W and will therefore cost more to run than more efficient rivals, so it’s a balancing act as to which is cheaper. You also get more features with a machine like the EcoAir DC202 (which draws 318W). If the Electrolux EXD25DN3W 25 litre is for you, ignore the ridiculous £299 RRP quoted, it’s seemingly permanently on sale at this store.